"A Keyblade that makes up for its poor reach and low critical hit ratio by providing an extra boost in Strength." Complete the Dead Ringer battle. 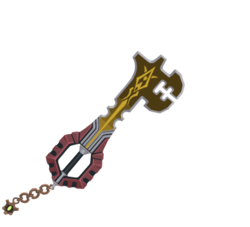 The Darkgnaw is a Keychain for Terra's and Player's Keyblades that appears in Kingdom Hearts Birth by Sleep and Kingdom Hearts Union χ. The Darkgnaw's design differs with its upgrades, most of which are only seen in Kingdom Hearts Union χ. The default Darkgnaw has a dark pink guard with eight semicircles surrounding it and a black grip. The blade has an edge that curves in at intervals, fading from pink to grey to golden with angled lines. It eventually reaches a golden line that stretches to the tip and creates a rune. Its teeth resemble those of the Earthshaker, but with a straight edge, resembling teeth. The Keychain bears golden links, with the token resembling that of the Chaos Ripper. 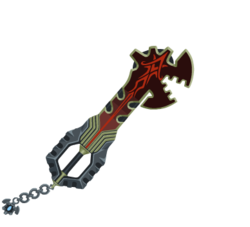 The first upgrade, also seen in Birth by Sleep, has a deep-grey edge which curves in at intervals, the inside fading from dark red to black from its base, and a bright red line and rune. The blade is notably bigger and with more spikes at the tip. The teeth are bigger and angled, resembling a maw. The guard is a dark steel blue with ten semicircles. The Keychain bears a strong resemblance to the one on No Name, complete with a Gazing Eye in the center. The second upgrade retains the grey guards, but now with pink edges at intervals. Three pink wings emerge from the base of the blade, and there is a pink orb near the base. The blade is bigger and is also pink, fading into violet with a white line and rune. The teeth are also bigger and look more monstrous. The Keychain is similarly pink, but with wings at the token. 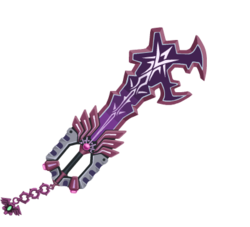 The third upgrade cloaks the Keyblade in a pink aura, with a lens flare near the blade. 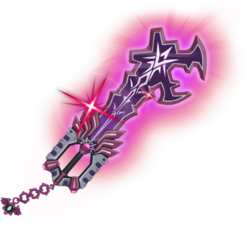 The Darkgnaw's name, as well as its Japanese name, "Dark Biter", refer to the Keyblade's teeth, which resemble an actual toothed maw. 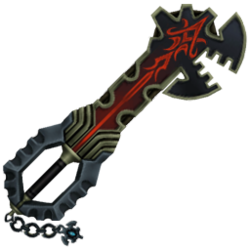 "Dark" simply reflects the dark design of the Keyblade.